Losing cold air is a problem with uprights. At Lowe's I tried to reach inside a small chest freezer and being short, I couldn't reach the bottom!! This is an over-flow freezer for when the house freezer section is full with my veggies, meats, worm food and compost food. Generally September-April. I plan to open it once a month to replenish the indoor freezer section. As it is right now, I can't find anything in the big baskets and packed shelves without removing packages. Being married, I worked carefully for two years to get a freezer in the garage, which Ken calls his space. So I did homework on small freezers with small foot prints. I carefully worded my desire to get a baby freezer to the point that when it was done and I thanked him, he was cheerful and said you're welcome. Even building the rolling platform and where it would sit, seemed like it was his idea. No, I'm not a timid woman. I just like my husband and I to be happy together. sanderson; it all makes sense I want one. I had not seen one of these. Now I want one. My LARGE upright is too big and takes up a lot of space. I had been thinking of getting rid of it but I still needed something for freezer jams and frozen soups and veggies.We have a chest freezer which is great for beef and pork but not for jars and containers. Thanks for the pictures. Not Available in Canada. I get mixed up with Home Depot and Home Hardware. @kygardener wrote: Thanks for the pictures. It's been a while since I posted on this California thread! The baby upright freezer is great. I can actually locate various frozen food in the indoor refrig-freezer! Cali is getting some much needed rain and mountain snow-pack. The burned areas are in danger of mudslides as expected Orchards on drip systems have had some toppling trees with their shallow roots. (Gone are the days of deep watering by flooding the orchards.) We are having some strong winds for Cali. Nothing like you guys in the hurricane and tornado alleys, but a lot for us. Every thing was battened down so only some empty plastic pots and twigs blown around in the back yard. As of yesterday at my house, 2-2-19! 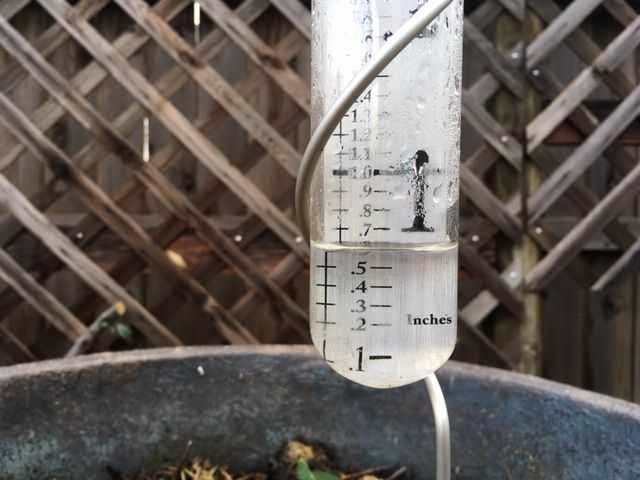 A total of 5" since October. 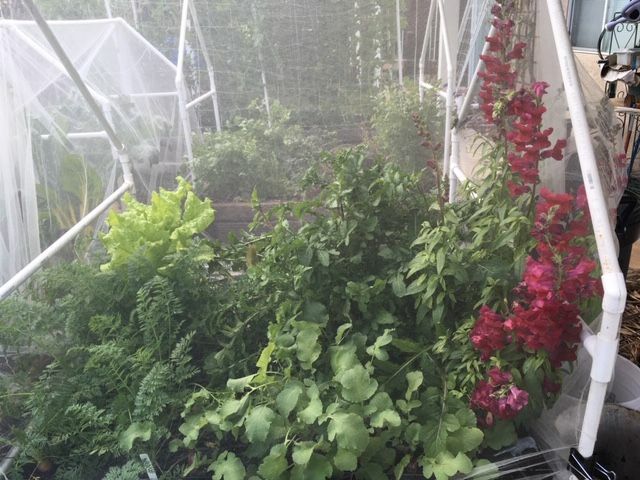 The salad bed has been a good addition to my winter garden. The lone snapdragon start is doing great in the MM. Little Fingers popping its shoulders up! I managed to prune the roses a week or so again. Now they are sending out new shoots, so I was cutting it close. We've received 5.5" in the last 4 days alone, and 1.2" in a storm a week earlier, so thing are pretty soaked. 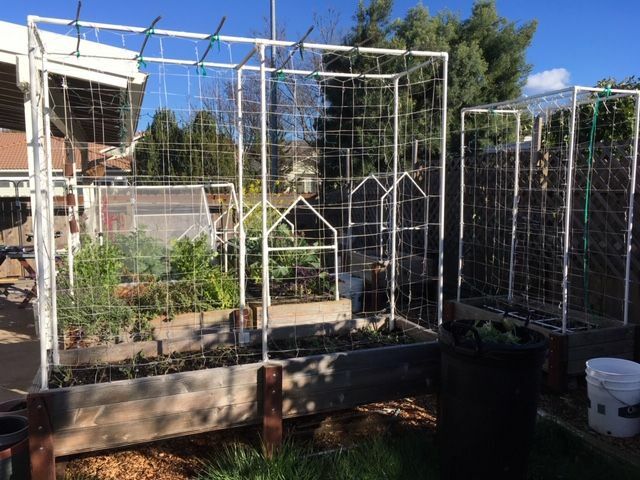 My veggie garden has been literally scalped by enormous flocks of Golden-crowned Sparrows that descend upon my gardens and devour anything soft and green to their stems. I am so upset that I wasn't able to shelter the veggies with the tulle I bought. The weather has been so bad, I was only able to use the time between storms to prune all the orchard before the fruit trees start budding. Well, at least the rain totals are back to "normal" for now. Thanks for reminding me that I need to prune the orange tree! 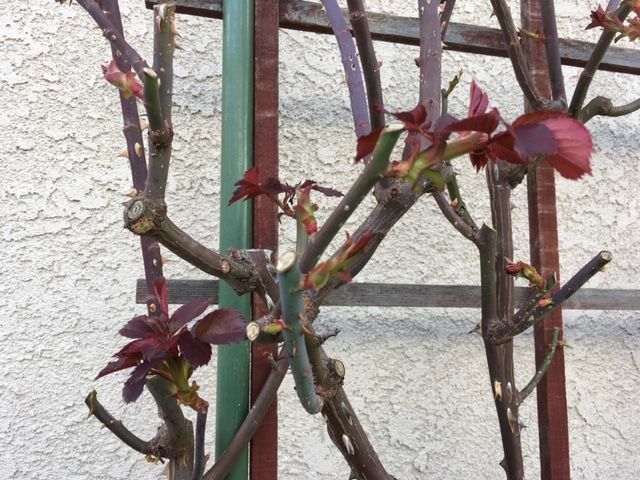 I'm so afraid it will start budding early like it did last year! Gads, it sounds like the attack of The Birds. Next year you will be all prepared. I wash the tulle at the end of the season and pin their tags back on for storage. That way I'm not out in the breeze trying to figure out which one goes on which bed. With the threat/promise of rain and then more rain, I've actually gotten some work done in the garden. I have always worked best under deadlines ;-) I've been going through my seeds and I collected all of the 2013 seed packets and sprinkled them on the tree median at the entrance of the neighborhood. With the coming rain, I'm hoping a few make it and make this median pretty! 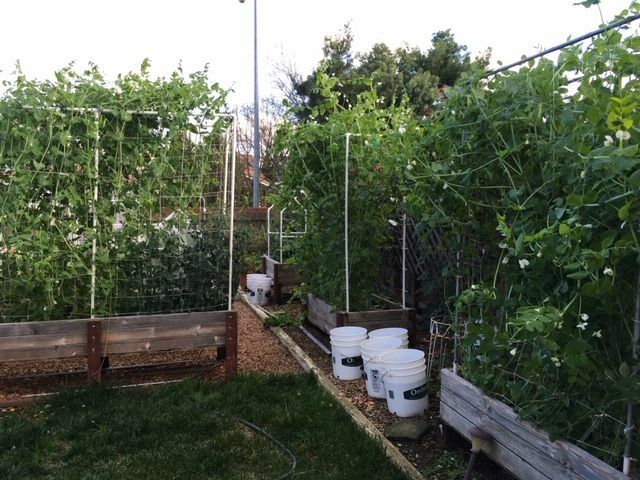 Nov 26: Four beds of peas. 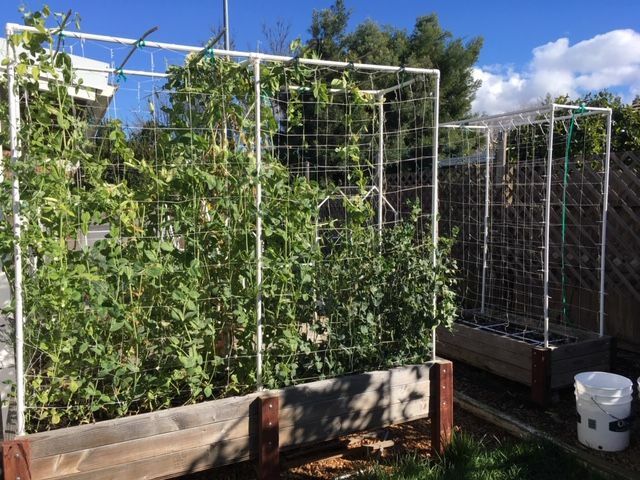 2-13 Trellis and string removed. PS: Still haven't pruned the orange tree. Very late start this year (thank you Mother Nature). Today I'm going to get the basement light setup going -- not a clue how to do it. If I get it figured out I'll post pics. I also remembered a pile of aged horse manure in the pasture. Gotta check that out. Lots more cleanup and bed prep -- normally done in January. Shouldn't I be snacking on sugar snaps by now? @countrynaturals wrote: . . . Shouldn't I be snacking on sugar snaps by now? Did you plant any last November? CN, sanderson is a Smartypants, in the nicest possible way. YEE-HAH! Got it all done. I knew it was going to start raining tonight -- and it already has. I needed to get my sfg bed ready to plant and my balcony plants into their permanent homes before the weather started, since it's gonna be more rain than shine for the next 10 days. 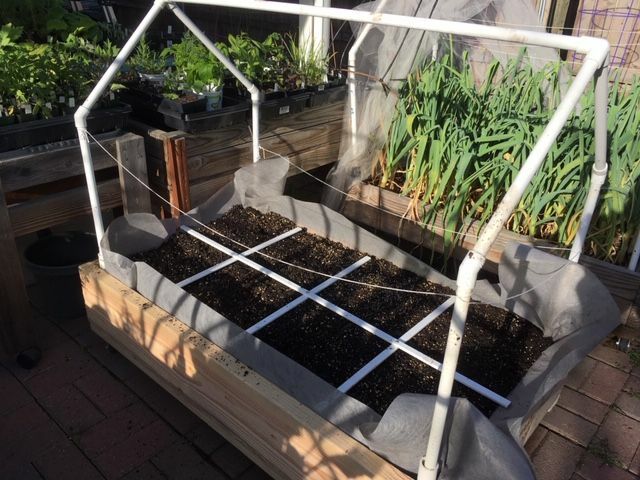 So, now my sfg bed is ready for grids, my 1st planting of sugar snap peas is planted in old peat pots (can't direct sow cuz of rolly pollies and slugs). Baby cabbages are in their containers. 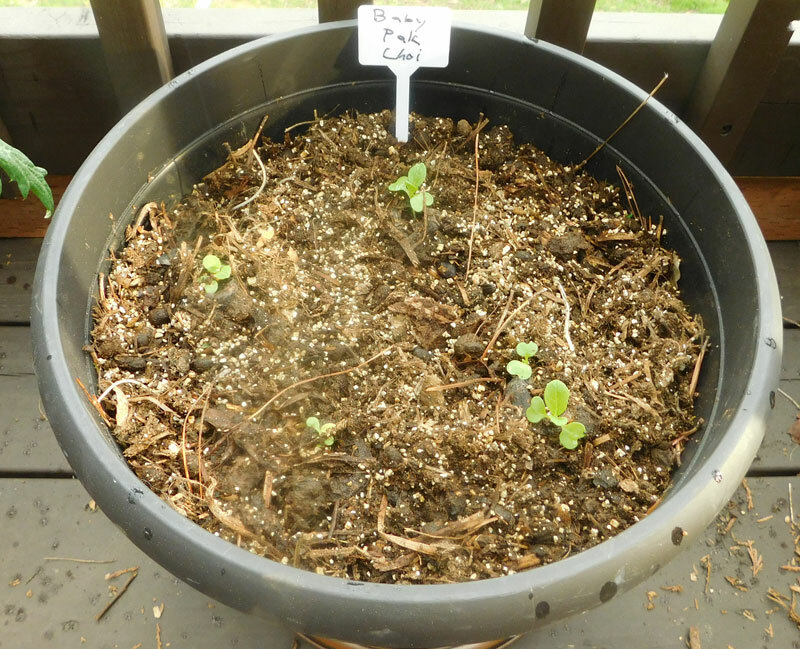 Baby pak choi seedlings are planted in their pots. Romaine is all potted up and I'M CELEBRATING! To me, it's not officially garden season until I have homegrown seedlings in their permanent homes. 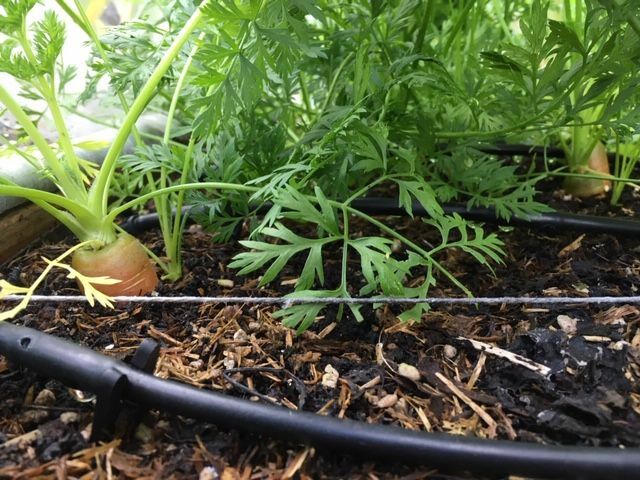 Everything looks puny cuz I usually wait until they're bigger, but Mel says to put them out as soon as they sprout so their roots don't get tangled in their Jiffy Pellets. Also, my onion seeds, zinnias, and tomatoes are starting to peek through. I put my trays of seedlings outside for a couple hours as it was 80*F and cloudy. So far, 0.05" of rain. Now that it's April, I am in full panic mode to get my beds amended and the seedlings planted. The bok choy, cauliflower and broccoli have all been pulled. 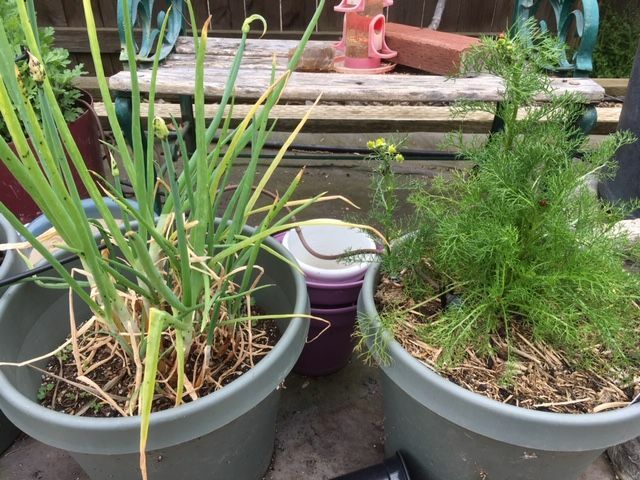 The winter cilantro is blooming and I will save the seeds for coriander. The starts have been camping out at night for several nights. The weather is pretty stable with nights around 50*F so I'm confident it's safe to plant. Some of my peppers and herbs didn't germinate, so I took their labels to Home Depot to buy replacements. I was able to find all but 5, thank goodness. I know I will not be able to make 100% of my compost needs anymore, so I am scrambling to find bagged composts to supplement. Lowe's HAD Ecoscraps Compost (veggie-based) but, they were having a hard time selling it so they put it on sale for a Dollar and it was all gone by this weekend when we went to buy it. I ended up with Nature's Care Really Good compost and Gardener's Chicken at HD. 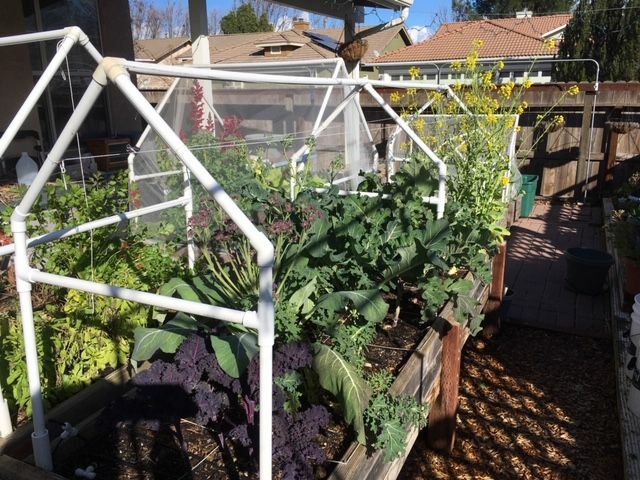 At an independent nursery, we found a variety made in Sacramento - green waste, veggies, chicken manure and "wood products". I felt around the bag and couldn't detect any wood chips so maybe they compost long enough. 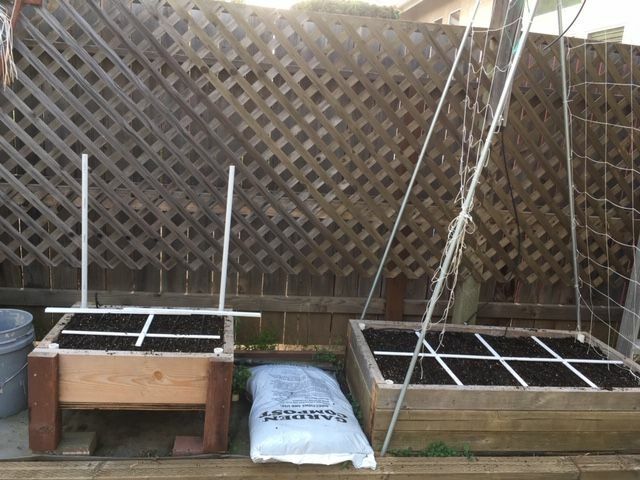 I started SFG in March of 2013 which means some of the original beds and Mel's Mix needs some attention. The 1/2" plywood bottom on one of the table top beds was detaching. The bottom was constructed with 3 patched together pieces of 1/2" which consists of 2 mistakes. One, using 1/2" instead of 3/4", and two, piecing them together. Ken removed the legs and it now sits on the ground which will buy a few months until it can be redone in the fall. I previously mentioned that the bottom fell out of one of the two beds on wheels that I am babysitting. There are 72 garlic in it and they won't be ready for harvest until July or so. The second bed was replaced today. Here are photos of emptying the bed (filled with worms! 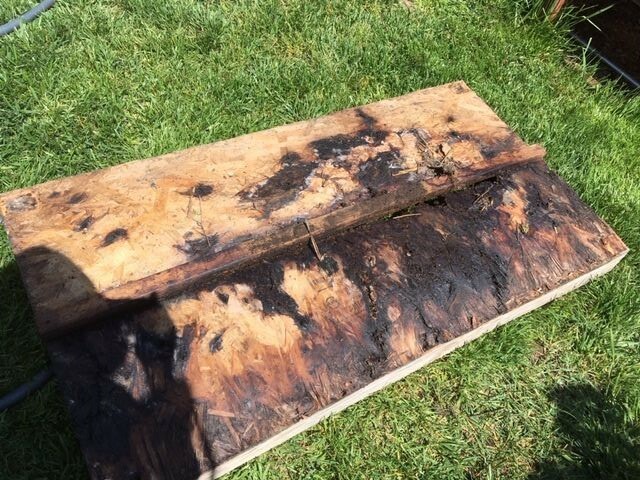 ), the rotted "fiber" board bottom (wrong word but it is made of shredded wood glued and pressed together) and the new bed with replaced MM and some extra coarse vermiculite. The grid is for another bed but I put in on for the photo shoot. The bed is 45" x 25 1/2" interior measurement for an equivalent of 2' x 4' of MM. The weed fabric has to be trimmed so please ignore it. 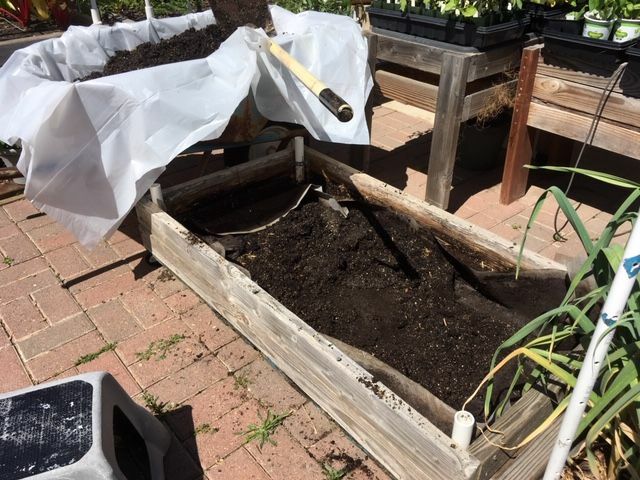 You can see the rotted garlic bed in the 3rd photo. I filled four 5-gal buckets and the wheel barrow. Shoveling is getting harder for me. It's hard to see in the photo but the grass is visible through the holes in the bottom. 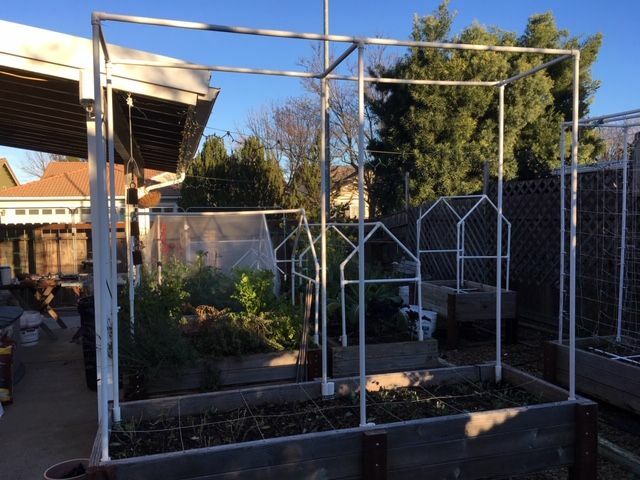 Still have to trim the fabric, make a proper sized grid and replace the driplines that are hanging over the frame of the garlic beds to get them out of the way. Some of the trays of starts are showing. I'm dragging my sore body to bed now. What are the rest of you doing, besides dreading the temps three months from now. For those who have planted, do you have a photo or two to share? Looks good Sanderson. What exactly is the purpose of the weed fabric placed in the beds.? I wore myself out yesterday, but I got the Salad Bar ready and the kale planted in there. Now I get a week off (rain) so I'll finish planting seeds inside and update my journal and 2019 garden plans. @countrynaturals wrote: I wore myself out yesterday, but I got the Salad Bar ready and the kale planted in there. Now I get a week off (rain) so I'll finish planting seeds inside and update my journal and 2019 garden plans. Also up-potted 12 tomatoes -- and I still know what they all are. Yolos, The new bed is raised off the patio on wheels. There are holes drilled in the plywood bottom for drainage. The weed fabric prevents the MM from washing out the holes. I did some major work today while the sky was cloudy. I got 8 beds amended with compost and coarse vermiculite. [Why I added an inch of coarse vermiculite is another topic altogether.] 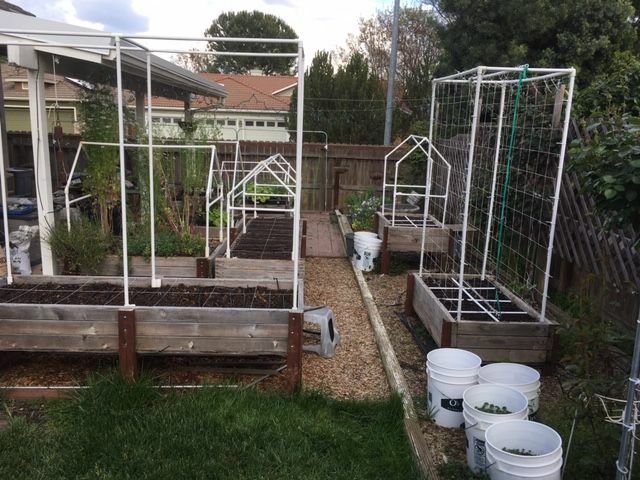 It took about 2 good hours to remove the grids and drip lines, add the amendments, mix deeply, replace the drips and the grids. The beds were filled with worms and these are table top beds! I have 4 more beds to amend, plus some 5-gallon buckets, 2 storage totes and a couple of pots for mint and dill. I hope to be completed by tomorrow. Look at how tall the cilantro is! It's flowering and I hope to save the coriander. 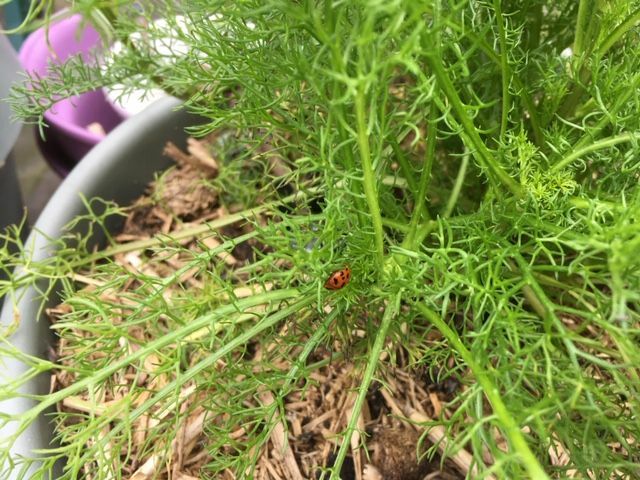 I have been noticing more ladybugs this spring than I have in prior years. As I have removed the winter plants, I've had to check for them before tossing the plants in the green waste. This morning there were 4 on the chamomile, while next door was a pot of walking onions and aphids! Wow lots of work. Looking good. Maybe the ladybugs will feast on the aphids. @trolleydriver wrote: Wow lots of work. Looking good. Maybe the ladybugs will feast on the aphids.